Kali and I have had a lot of fun blogging since she landed in America on May 24, 2014. Comments and “Likes” by followers have been encouraging and appreciated. Reading some of your posts and learning about your experiences are inspiring and motivating. Thank you. Kali’s nature and tendencies, OK – my nature and tendencies are to organize; to put things in order. I need a certain amount of structure in my life. When I have it I am more creative, more effective, and happier. 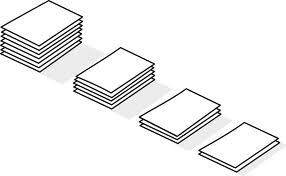 With paper documents I tend to organize them in piles in my office until I’m sure I am finished with whatever needed to be done. These are neat piles – not cluttered, I don’t like clutter. They remain in view but off to the side so they are not forgotten and so that they are easily accessible. Now for Golden Kali I have created virtual piles of our stories organized into categories. While this structure should have little to no effect on readers of Golden Kali, it makes Kali and I… OK it makes me feel better to have some structure around Golden Kali posts. The Word Press theme used for Golden Kali doesn’t provide multiple menus (maybe we’ll look for a more robust theme at some point but for now this is what we’re going with. So, the “piles” will appear on the side-bar of the blog in the section called “Dog Piles”. (Off to the side so they are not forgotten). Whether you shuffle through the piles or not please please keep reading and following this wonderful girl we call Golden Kali. 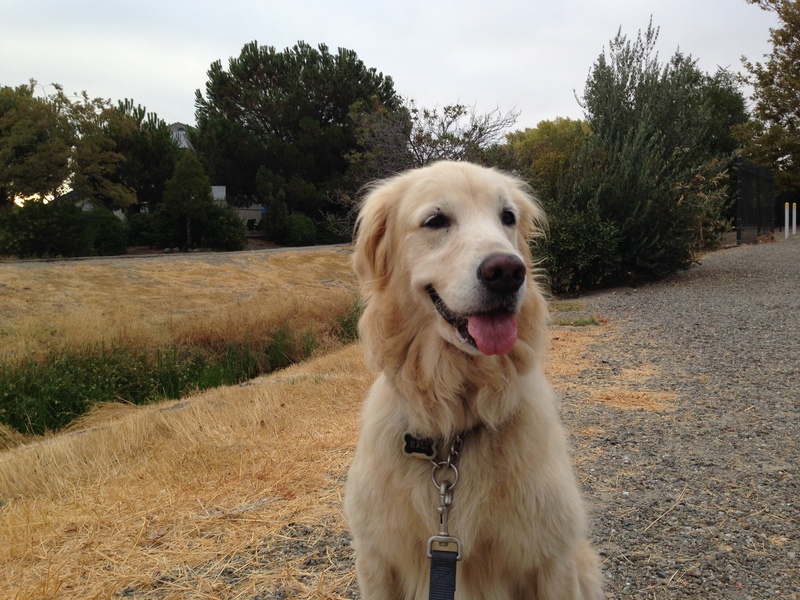 Tails From The Trail: Kali and I walk almost every day along the trails near our home. This pile includes posts about our walks, or inspired from our walks, along the trail, creeks, golf course, and throughout the surrounding neighborhood. The Pack: Our family is always stronger when we’re together. As the saying goes, “The whole is greater than the sum of its parts”. This has always been our family and since May 24, 2014 Kali has been one of those parts and the whole is even stronger because of her. This pile has posts about our family; our “Pack”. Wagging Tales: A commen misconception is that just because a dog’s tail is wagging that she is happy. A wagging tail can mean a lot of things. But this blog is not about science so this pile will be for posts about experiences and events that make Kali or other members of the pack happy and feel good. Woof! : Occasionally there are events, experiences, or interactions where it is best described with a cartoon thought bubble over my head or Kali’s that have “?! ?”, or #!&%@*, or “¯\_(ツ)_/¯”. This pile will include the Woofs we experience along the way. “Micro-Chips”: From time to time I come across content from other bloggers, websites, or news feeds, etc. that interest me and may interest some of you. The Micro-Chips pile may be re-posts of other bloggers, a picture, a link, or just a brief thought inspired by Kali’s new life in America. I’ll stay here. You go organize something and let me know when it’s time for my walk. Wow – what was that?? Kali and I walked on in relative peace having done a very good job of avoiding what could have been a confrontation. Kali and I love our walking trail. The trailhead is within a stones throw from our front door. It winds around with the neighborhood, intersects at points with a municipal golf course, and has a creek that runs throughout. Kali and I have become intimately familiar with the trail having walked it almost every day for the past six months. 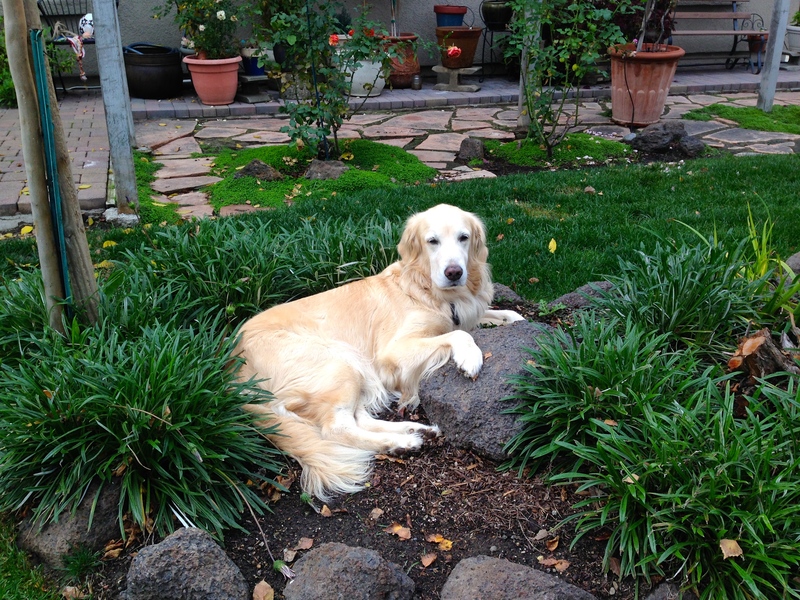 We’ve also become familiar with many of the faces – both human and canine – that we see often. We’re blessed to have the time, the area, and health to be out and about in such a beautiful environment. The single blemish on this otherwise perfect picture is that Kali has leash aggression. I’ve come to grips with that. I’ve done a fair amount of reading and research and it is clear that this behavior will take us a long time to work through. Maybe she’ll never get past it. But I’m committed to partner with Kali in the most positive way possible so that one day she will be able to meet another dog without lunging or barking and instead simply sniffing, playing, and enjoying their company. Kali and Smokey bonded very quickly. They are wonderful to watch. So I know Kali can be a loving and enjoyable companion for another dog. She’s spent extended face to face time with just one other dog – a close friend’s dog – and after the usual barking and anxiety she settled down and got along just fine. In fact they were in the back of our SUV for an extended drive laying next to one another and Kali was very calm and comfortable. Kali is very eager to engage with me. The first thing I taught her was to “watch” me and then I would immediately reward the eye contact with high value treats. This fundamental discipline and foundation for effective training has been invaluable. I say “watch” or just stand in front of her and she’ll gaze into my eyes and wait for me to tell her what to do next. All it takes is the word “watch” and more lately just the click of my tongue. On our walks I am proactive when we approach another dog. I’ve learned to make sure that Kali is more interested in me than the oncoming dog. We take care not to walk a direct path into the dog, we’ll take a wide berth when there is room on the trail, or simply pull over to the side with Kali’s back to the dog and attention on me as the dog and owner pass by. A couple of “watches” and a “let’s go” and more often than not there is no barking or lunging and we continue to move along our way thankful for the aforementioned blessings. Sometimes I’ll stop and turn around after we’ve gone a short distance and have her sit facing the other dog who is now walking away. “See Kali, no danger. I kept you protected. I’ve got your back. It’s ok to relax. Let’s go”. For Kali and I it’s all about the positive. Praise when she get’s it right. Understanding when she doesn’t and self-evaluation to see what I could have done different to make her successful it the particular situation. It’s helping and I’m optimistic that over time – probably a long time – we will overcome this behavior and Kali will be able to enjoy being around other dogs. So did someone get punched in the face? The short answer is I don’t know. On an otherwise non-eventful walk yesterday I saw an owner with her dog come around the bend about 150 feet ahead of us. As we approached each other Kali and I used our techniques for keeping her calm. I moved to the edge of the path, “Kali. Watch.” She does. “Good. Watch.” Kali takes a quick look over her shoulder at the dog and then back at me. ; loose leash no barking. “Good girl! Let’s go.” Kali is relatively calm and we peacefully move along our way. BUT, as we pass by I get a closer look at an uncomfortable owner and a fearsome looking dog. This dog could eat Kali for lunch if it wanted. It probably didn’t want to but that’s the look the dog had. The owner had a very tight leash on this dog with her fist about 12 inches from the dog’s neck jerking up with all her might, and the dog choking from a now very tight collar. The dog was very mad and upset. Who could blame him? To be fair maybe this dog has serious aggression issues and would actually have eaten Kali for lunch if the owner had not restrained him. Or, maybe it’s the owner who has serious aggression issues and needs a punching bag other than her dog (the Blogger says judgementally). I look back over my shoulder as we move on and I hear the owner say as she pulls up on the leash, “No. NO! I will punch you in the face”. I wanted to go back and give the dog a hug. I didn’t. I wanted to go back and punch the owner in the face. No, of course I didn’t. Kali just wanted to continue walking home and of course, we did. So did someone or something get punched in the face?. I guess I’ll never know. Kali is all about the food and even after meals acts as if it’s been days since she ate. I’ve very conscious of making sure she maintains a healthy weight and diet. So I am always looking for healthy snacks as well as ideas to keep her entertained during the day. 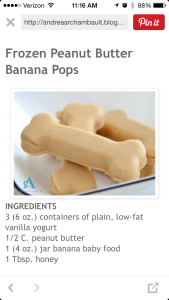 This recipe shared by another blogger I follow shows a very “cool” recipe for Frozen Peanut Butter Banana Pops. I’m not a cook or a baker but I think even I could manage this recipe. So they are probably in Kali’s near future. I thought that some of your fur-babies might like these too. I will be the first to admit that when it comes to taking care of Tobin, I can be a little over zealous — like a helicopter mom. With some of my extra time, I began researching dog treats — the best store bought kinds and dog treats to make at home. Instead of coming home to fresh-from-the-oven human food, my boyfriend would frequently catch me in the kitchen making dog cookies. So after a little trial and error, I have a narrowed my list down to three must-have Tobin treats. #1 is a homemade recipe I found by Andrea Arch while scouring Pinterest. “A picture is worth a thousand words” It’s not entirely clear who originally said this, or if it was ever said. More than likely it is a variation of what was actually said or written. At the end of the day (I wonder who first said that phrase) it really doesn’t matter. For me it’s the practical aspect of the phrase that counts – a picture can tell a story, elicit an emotion, call up a memory, inspire, etc. It’s in that spirit that I’ve added a gallery of Kali related pictures to the Golden Kali blog. Pictures that hopefully over time will tell the story of Kali’s life in America. This most recent picture of Kali taken on our walk yesterday instantly became one of my favorites. 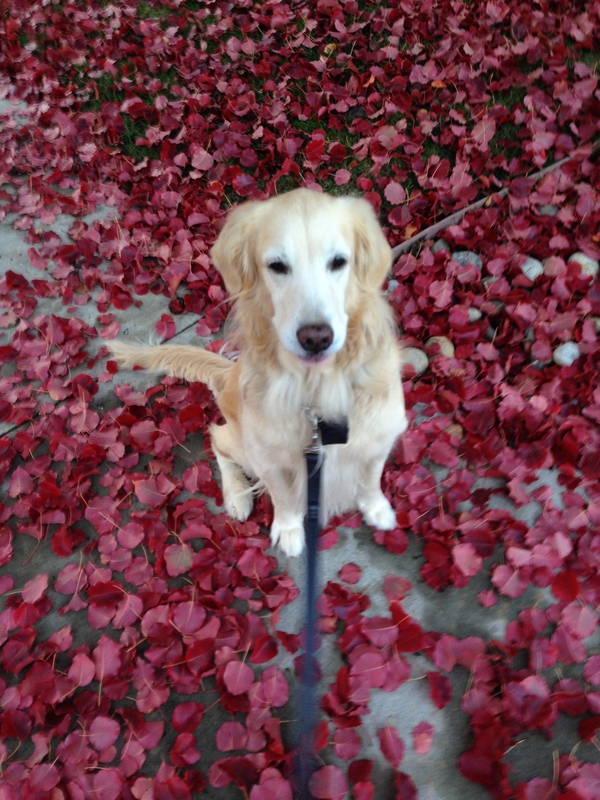 The colors of the leaves contrasted with Kali’s fur is striking and beautiful. Kali’s calm and patient demeanor is evident in the shot. As is typical with Kali, she was a willing participant and patient model. It was late afternoon, overcast, relatively warm, and very calm. We decided to take a different route through the neighborhood since we had already walked the trail earlier in the morning when it rained on us the entire time. So by afternoon the ground was still wet , the air was mild, and the leaves were abundant. And as usual, Kali was Golden. Well, I guess she’s not an angel after all…. No, not the lighted angel, Kali. The green painters tape clinging to her belly hair was all the evidence I needed. The day after Kali arrived in May she was checking out the house and exploring her new surroundings. Sniffing around the couch in the family room she put one paw up on the seat cushion and slithered up onto it like a snake. I gently pulled her down and said, “No, stay down Kali”, and she moved along her way sniffing and exploring. That was the end of that. Or so I thought. A few days before Kali came home we bought a crate for her with a soft bed in it. We bought it so that she would have her special place and for all the obvious reasons families provide crates for their dogs. She would go in it if asked to but never on her own. She didn’t need it or want it and she was always very respectful of the house. So after a few weeks we took it down and put it in storage. During the hot summer Kali enjoyed laying on the cool tiles in our kitchen and family room. Whether we’re home or not Kali has the run of the house and we’ve never had any reason to not trust her. Or so I thought. Thanksgiving night we set up our Christmas tree in the living room. We have to move around furniture to accommodate placing the tree where we like it. As with most other events and changes around the house Kali was lying in the thick of the activity, unfazed, and more than willing to allow us step over her or around her. Why get up or move, right? The next day as I was coming down the stairs I see Kali slowly getting off the couch. This is a different couch than the one she slithered onto in May. That was a cold leather couch in the family room. This couch, in the living room, is a warm fabric couch and much softer than the leather one. It was a rather cute scene but I thought I better not let this become a habit. So I took her to the couch and gestured that it was not ok to be on it. This in itself is funny because several seconds had passed and Kali had no idea what I was talking about. The next evening Holly and were going out. Kali and Smokey would have the house to themselves for a few hours. I wondered out loud to Holly if Kali would get up on the couch as she had the day before. It’s not that we really care. It’s just the principle of setting boundaries for Kali and making sure she continues to respect the house. On the other hand, and in Kali’s defense, Smokey also has the run of the house including couches and chairs and beds and anything else warm and comfy he can jump onto. When Smokey does it it’s cute and expected. When Kali does it it’s not OK. So, like I used to tell my kids when they would compare themselves to each other for some reason and say, “that’s not fair – so-and-so get’s to do it”. I would reply, “If you want to compare let’s do a thorough review and see what I should not let you do because your brother or sister doesn’t get to and it wouldn’t be fair to them”. I may need to have this conversation with Kali in the near future. Holly, replying to my musing about Kali getting on the couch while we would be gone, says, “hey – do the tape thing that your friend Marty told you about and we’ll find out”. 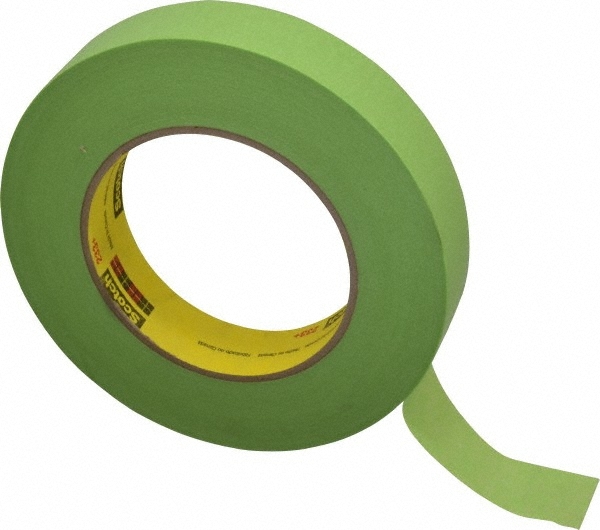 The “tape thing” is placing painters tape – sticky side up – on the couch so that if the dog was to get on the aforementioned couch the tape would become attached to the aforementioned dog (that’d be you Kali!). I strategically place the tape on the couch – sticky side up – and we walk out reminding Kali and Smokey to be good while we’re gone. They stare blankly back as is the norm when we leave together wondering why they can’t go too. A few hours later when we get home Kali greets us at the door leading into the kitchen from the garage as she always does. I immediately go the couch to check the status of the tape. It’s gone. Hmm… Meanwhile Holly is laughing while Kali stands there with painters tape securely attached to the hair on her belly wagging her tail welcoming us home. Holly and I laugh because we’re not surprised and because Kali looks silly and so very guilty. 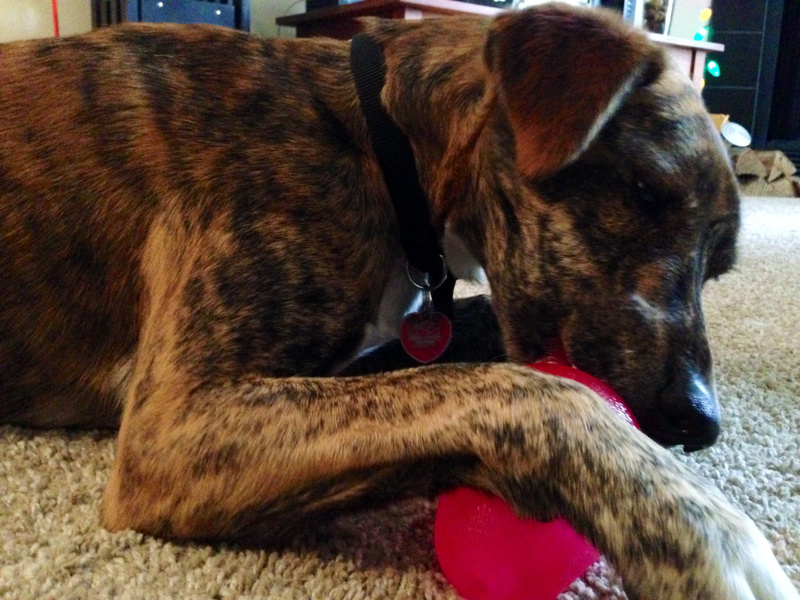 Kali, continuing to wag her tail now with an increased velocity, implies that the evidence is circumstantial. She continues to welcome us home as I rip the tape away from her long hair. This of course doesn’t faze her in the least bit. Her world is good again and so is ours. The pack is reunited. We’re all together again, at home with two couches and plenty of painters tape.